When it comes to the Federal Reserve’s emergency lending powers, the crucial word is “solvent.” That’s because both by tradition and, since the passage of the Dodd-Frank Act, by law, the Fed can use its emergency powers to make loans only to a solvent institution. In 2008, that’s why Bear Stearns and the American International Group, both deemed solvent by the Fed, were bailed out — while the investment bank Lehman Brothers, said to be insolvent, was left to fail. Or so top officials at the time have said. But what did “solvent” mean to those officials? Recent testimony in the continuing litigation over the government’s rescue of the insurance giant A.I.G. — its former chairman and chief executive, Maurice Greenberg, claims that the bailout was unconstitutionally punitive — suggests that solvency had little or nothing to do with the Fed’s decision to lend. Numerous firms deemed insolvent nonetheless got emergency loans, while Lehman alone was denied one before it went bankrupt. Judging by their actions, Fed officials seemed to have defined solvency on a case-by-case basis. But how can a firm be both solvent and insolvent at the same time? And how could such an important determination be a “complete fog” to the president of the New York Fed? To be fair, Mr. Geithner was backed into something of a corner by Mr. Boies, who as part of the discovery process obtained notes in which Mr. Geithner wrote, without any qualification, “Certainly Citi and Bank of America were insolvent.” Yet both Citigroup and Bank of America received emergency loans from the Fed. Mr. Geithner also agreed that there were serious questions as to A.I.G.’s solvency, and A.I.G., too, received extensive Fed support. 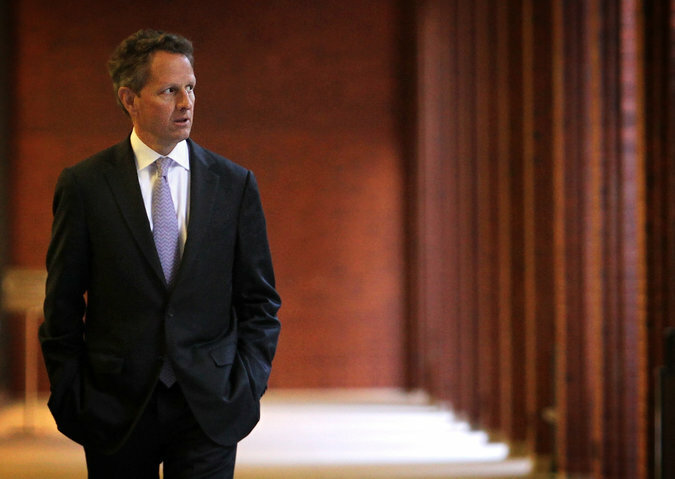 Through a spokeswoman, Mr. Geithner declined to elaborate on his testimony. After the financial crisis, and facing persistent questions as to why some firms were bailed out and others weren’t, Congress sought to clarify the Fed’s emergency lending powers as part of the Dodd-Frank Act. The Federal Reserve Act was amended to make it explicit that only solvent firms qualified for loans, and the act further defined “insolvent” to mean “in bankruptcy” or other insolvency proceeding at the time of the loan request. But that definition is so broad as to be all but meaningless. “It’s a huge loophole,” Professor Goodfriend said. By that standard, Lehman Brothers was plainly solvent, since it wasn’t in bankruptcy proceedings when it sought the Fed’s support. A spokeswoman for the Federal Reserve in Washington and a spokesman for the New York Fed declined to comment. The Federal Reserve’s friends and foes alike seem to agree that the current state of affairs is untenable and that the nation is ill prepared for another crisis. They argue that either the Fed should have broad discretion to lend in an emergency, without being hobbled by technical definitions of solvency and ambiguous limits to its powers, or it shouldn’t have any discretion at all. The issue is almost certain to heat up now that Republicans, with a capital “r,” have taken control of the Senate and expanded their majority in the House, since some of the most ardent critics of the Fed’s emergency powers are Republicans (among them, Senator Rand Paul of Kentucky, a possible presidential candidate). But the issue doesn’t break along traditional party lines. Liberal Democrats, including Senator Elizabeth Warren of Massachusetts, have criticized what they deemed the Fed’s bailout of wealthy Wall Street bankers. Senator Warren has joined a Republican senator, David Vitter of Louisiana, in calling for more curbs to the Fed’s emergency lending powers. Whatever the political outcome, testimony in the A.I.G. case has further undermined the Fed’s claim that it acted consistently during the financial crisis, rescuing only those firms that were solvent while letting an insolvent Lehman fail. A version of this article appears in print on November 8, 2014, on page B1 of the New York edition with the headline: Solvency, Lost in the Fog at the Fed.